When I heard about the One America Trip last fall, I couldn’t believe that I missed out. I honestly did not know there as such a class devoted to our own country’s history. And to top it off, the opportunity to go to the cities that we learned about. I love to travel to new places and decided that next year, this coming fall that I would sign up for this class. When looking at courses to take, I figured that since there was only one spot left, I decided to take it. I was so relived and happy that I would have the chance to learn about the South. I have never been to the South and I have always wanted to have a chance to travel there. Living in New England, which is in the North and real cold in January, a visit to the South for a week will be a nice change. Charleston has always been on my To Do List and going there will be a great experience. Their culture is so different compared to New England and I hear great things about their Southern ways. “Southern hospitality” is something everyone who has been to the South has talked about. I know the South, and especially South Carolina, the residents are very fond of their secret gardens. So I hope that we get the chance to browse their treasures of greenery. Going to Savannah will be interesting as well. I know about the cypress trees and the hanging moss, but I cannot wait to learn more about this beautiful city. When I researched Savannah, Georgia, I was very impressed by the historical charm. It was interesting to learn that this city has won some great honors. Savannah has acquired these achievements among others; “America’s Most Mannerly City”, “Best Southern City”, “Top 10 Trips to Reboot Your Life” and “Top 25 City for the Arts”. Activities that caught my eye are the diverse types of tours offered. I am impressed with the haunting history of Savannah. I hope that we have the opportunity to go on a ghost hunt tour. Other then the ghost tours, I wondered how much fun it would be to see the charming homes and gardens, visit the art museums and ride on the trolley through the city. Architecture is an important part of Savannah’s history, so being able to take a guided tour would be an adventure. I personally enjoy a good art and architecture tour, and what other place to do it, then in Savannah? Going to Atlanta will be a brand new adventure for me. The only times I have been in Georgia is at the airport. When I researched Atlanta, I found a great resource with 50 Fun Things in Atlanta. Although there so much to see in so little time, there are places that sounded exciting to visit. The World of Coca- Cola sounds like a unique place to visit. Another destination that sparks my fancy is the Atlanta Botanical Gardens.Just walking around Atlanta will be a great adventure. They are known for their historic West End, and I think it would be so much fun for us to just walk around the city. One thing is for sure, we will not be bored while traveling in Atlanta. What could make this Southern trip complete? The food. Southern food is a culture in itself and being able to taste it prepared authentically will be exciting. Just thinking about grits makes my taste buds say “This is a strange texture” and make me think of “My Cousin Vinnie”. I have to admit, I am a fried food fan and there is the possibility I might gain some weight on this trip. But I am not too worried since I could lose all that weight running away from ghosts on the tours. What I hope to gain, no not weight, on this trip will be knowledge. Traveling to these three different, yet all incredibly historic places, will be a life changing experience. To be able to say that I have been to some of the most beautiful and welcoming places in the United States, I will have earned bragging rights. A few things are certain, I will be coming home to Rhode Island; feeling very relaxed, polite, and historically informed about three southern cities. And craving chicken and waffles. So, long story short, my family and I went on vacation. All together…and we all made it! Hahaha! Since I took hundreds of pictures, I will be posting some each day, hopefully! Oh, and it was Bermuda, home to knee-high socks and loafers Yup, pretty epic! Too bad they did not wear navy/lime green, or lime green/pink striped socks, that would be even more amazing! Bermuda really is the home of Bermuda shorts. There where everyone where! Pink Bermuda shorts were plastered on just about everything! Sugar packets, the airport, hmm, what else? But to my somewhat dismay, not that many people actually rocked the pink look. I guess that style went out there when it come other to New England, especially certain places of Rhode Island (which is areal state, not just from Family Guy). So, this is just a warning to all who read this (oh, and thank you for doing so!) Bye for this moment! 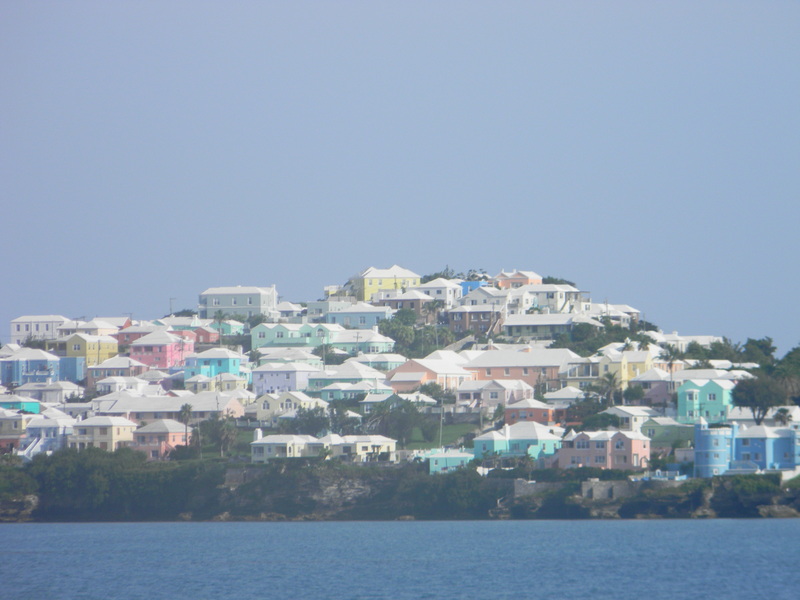 Here is a photo of a group of pastel homes that I took on the ferry! Enjoy!